It could be a cloud in the shape of a loved one's face or an extremely relevant song playing on the radio at the exact time of a friend's death--if we allow ourselves to stop, look, and listen, we can identify what spiritual teacher Ann Bolinger-McQuade calls personal oracles. And when we tune into these subtle messages from Spirit, we will discover guidance for navigating life's most trying situations. A PAIR OF SPARROWS SAVE A MAN'S LIFE: Journalist Byron Pitts narrowly escaped being hit by a car and saw a couple birds circling in front of him. The birds reminded him of the lyrics to his mother's favorite hymn: "His eye is on the sparrow, and I know He watches me." The comforting reminder of guidance and provision encouraged him to persevere in his challenging career in broadcast journalism, which was ultimately rewarded when CBS offered him a position on 60 Minutes. A LITTLE BOY BRINGS HOPE BACK INTO A WOMAN'S LIFE: Nancy was reeling from her husband's recent diagnosis of AML, a rare form of leukemia, when a seven-year-old boy knocked at her door collecting donations for AML research. He smiled at her warmly as he told her how he had had AML since he was two, and then he announced proudly that a transplant had saved his life. SIR ISAAC NEWTON'S APPLE WAS ACTUALLY AN EVERYDAY ORACLE: Many are familiar with the story of how Sir Isaac Newton first discovered gravity when an apple fell on his head. It is a lesser known fact that Newton was interested in the supernatural. Born in the 1600s, when astronomy and astology were considred one and the same, the highly respected alchemist looked to the heavens to assist him in his quest to decode the mysteries of the universe. The falling apple that arrested his attention acted as a personal oracle. 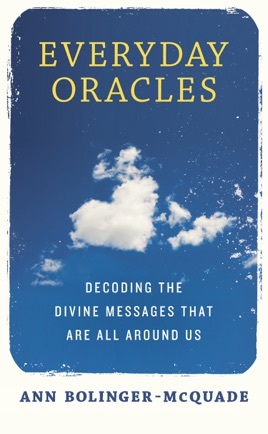 In addition to illuminating oracles through examples, McQuade discusses the history and science of oracles in general and of personal oracles specifically, offering the reader practical instructions for identifying and decoding the divine messages in their own lives.